Lumpectomy is one of the two surgical options offered for surgical treatment of breast cancer. The other is mastectomy. The word lumpectomy means removing the cancer and some normal tissue around it, to make sure all of the cancer is removed and the “margins” are negative, leaving the remaining breast tissue behind. Other terms used when referring to lumpectomy are biopsy, partial mastectomy, wedge resection and quadrantectomy. Every patient who receives a lumpectomy will then receive 5 to 7 weeks of radiation thereafter. Radiation is like the insurance policy to make sure that any spare cancer cells that might be left behind are addressed. It is the combination of lumpectomy and radiation that is breast conservation therapy, and the two must be combined. Radiation may be delayed if the patient requires chemotherapy. Studies show that women are just as likely to be alive, disease-free 20 years after surgery with lumpectomy and radiation therapy as they are with mastectomy. It is important to note that recurrence of cancer can occur in a breast after lumpectomy and radiation, with an incidence of 10-15%, and this is well treated with mastectomy. Is lumpectomy right for me? Lumpectomy is a good option for many women with smaller tumors and a reasonable amount of breast tissue. It may not be a good option for women with smaller breasts as removal of the tumor may be disfiguring and cosmetically unappealing. It is not a good option for women with large tumors or have two or more separate areas of cancer in the same breast. In those women, a mastectomy may be a better option. Lumpectomy is good for women who have never had radiation to the same breast for an earlier breast cancer. Radiation cannot be given twice to the same area. 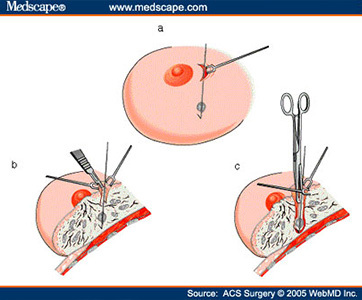 In lumpectomy, there is a risk that the tumor is not able to be removed during the first surgery. In other words, the margins are positive and more tissue needs to be removed. If the cancer cannot be cleared with lumpectomy alone, a mastectomy may be required. Be sure to ask your surgeon what he/she expects your breast to look like after surgery and radiation and how that will impact your breast symmetry. Also, inquire if a referral to a plastic surgeon might be helpful or necessary. If your mass is not able to be felt, you will get what is called a needle-localization where a radiologist will identify the tumor and place a wire in it to aid your surgeon in removing all of the necessary tissue. If the cancer is palpable, you will skip this step altogether. Your surgeon will make a small incision on the breast and remove what must be taken in attempts to get all of the cancer, and the procedure takes about 45 minutes. The specimen is then sent off to be evaluated by the pathologist and your results will be available in about a week’s time. You will wake up with a small bandage on your breast and most of the time will be allowed to go home that same day. Most women do not have a tremendous amount of pain after a lumpectomy. Your general surgeon will give you instructions on postoperative care, follow-up, and activity restrictions. Would seeing a plastic surgeon prior to lumpectomy be helpful? « Who’s on my Team?